It pays to understand how Cytocentricity benefits cell research and can help stretch your research dollars. 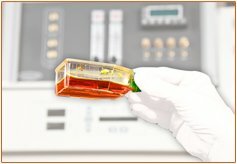 Cytocentricity will save you time and money by decreasing variability, increasing consistency, avoiding contaminations, and reducing the number of failed experiments. Best of all, it will make your data more relevant, and thus fortify the credibility of your conclusions. When your data is generated from cells under conditions different from what they would normally experience in the body, relevance of that data is questionable. By better simulating physiologic conditions, your hypotheses will be more accurate. In the old days, cell culture was all about cell growth. Now it is more about the induction or maintenance of phenotype. Cytocentricity gives you unprecedented control over phenotype. First, more critical cell parameters that affect phenotype are offered (O2, CO, NO, etc.). Second, comprehensive control of those parameters is inherent. Phenotypic response to an environmental cue is sensitive, so finesse is the key. Dynamic control provides you with patterning to deliberately induce a change in gene expression. Uninterruptible control of all parameters prevents unintended confusions in gene expression to better maintain phenotype. Newly recognized fundamental role of O2 in gene expression may impact all cells. Nothing does O2 better than our equipment designed for oxygen. Cytocentricity, or better attention to cell needs, will decrease experimental variability, decrease your standard deviation, and thus reduce the amount of materials (fewer plates, less media, etc.) and decrease the labor and overhead required to perform the experiment with no compromise in your confidence level! Cytocentricity will make your cell research results more consistent. Cytocentric™ processing in closed incubated hoods avoids the suboptimal conditions, avoids the need to hurry, decreases human sloppiness, and increases consistency. Cytocentricity can reduce contamination risk in your cell research by a large factor.